Comments on "Hard Rain At Marni"
Poor kid needs a bigger more stylish umbrella. Plus some rain shoes. She's going to be squishy and miserable the rest of the day. I'm loving your work more than ever at the moment!! I can feel that rain! Great shot! i am waiting marni.....im here patiently. i want to see the new show!!! Yes, one part Singin' In the Rain, but one part Cartier Bresson. Love this. Even the broken umbrella looks stylish in a Marni way ! Mother Nature waits for no man. Four feet and only one on the ground! Unless I'm mistaken, that man has been featured here before, and has looked marvellous both times. Nice photo. It makes me miss walking in the rain. I'm not sure why the chap on the left is in such a hurry. Perhaps he is worried the rain will clean his dreadlocks. In which case, he should consider purchasing a dreadsock. Just a suggestion. My knowledge of rasta 'fashion' is sadly deficient. Gorgeous picture. The guy looks like he's running in a circle...what a wonderful thing to capture in a photo. Also, gotta love the dreads and the impractical peep-toes, non? Said it before...non posed shots are the best. Very nice shot. You really get a sense of the down pouring of the rain, especially in the huched over woman. Plus, there's something vaguely gratifying about seeing dampened sartorialists (though, I should hope that they have better umbrellas at home!). the man is gianluca cantaro of l'uomo vogue. he is very stylish, well respected and a wonderful person to work with. and to laguna beach trad...... many people with locks DO wash their hair as much those without locks. i doubt it is considered "rasta fashion" just basic personal hygiene. Jezo, that's great--he's completely off the ground! I recognize the guy with dreadlocks.. terrible everywhere in the world.. I saw him at Gucci today, while we were waiting for the second round,in the rain. and he was running around, so petite.. who is he? The moment this picture captures is stunning, like a Henri Cartier-Bresson photograph. the best thing is the umbrella. i'm sure we've all been walking around the city on a rainy day with nothing to protect us but the ubiquitous cheap umbrella from cvs (or duane reade for all you new yorkers) which of course breaks as soon as you open it. its comforting to know that even the most fashionable people at marni are just like us, sometimes. 10 extra points for realism and empathy, sart! must be tough to find a properly huge travel umbrella. poor girl! I hope the marni venue was toastier! LOVE IT. if not for what they're wearing, for the composition and joy in the movement. Beautiful shot. Colour of that background wall and that angry rain. Lovely, well done. Poor Gianluca under the big pour! If you crop the top of the wall so that the background is all ochre this will be a fantastic photo, independent of whether it's "fashion". Of course! That's Gianluca Cantaro of L'Uomo Vogue! He was featured on here before, back in July. I love both shots. This is SUCH a compelling photo. My goodness Sart, you are on fire - yes, even in the rain. I love how the muted primary colour-blocking in the background provides a perfect background for the neutral-dressed duo. And the diagonal line where red meets yellow leads the eye to the amazingly off-centre mid-air sprinter. I'm so enthralled and impresed by your work. And the Marni card on the diagonal just perched in the woman's hand is really too perfect. I also love the way the two players look SO intent on getting into the show. 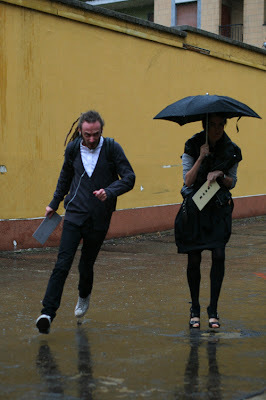 It's like they are posessed with desire to see the Marni show and not even grey skies and a rain shower can impede them on their separate missions to catch a first glimpse of Spring 08. This leads me to another idea: part of what is so compelling about fashion is that it is always in the future, and therefore transportative. When the Spring finally arrives and life may or may not bring all that we had hoped for, we can dreamily look at images of what the next Fall will look like and continue to entertain our illusions about what is possible, beautiful, and intellecutally fresh. Not to mention see impossibly beautiful and seemingly naive girls parade down a stage creating an other-worldy fantasy-scape for us to enjoy. Ah, fashion, you are both master and muse. Thanks for the id everyone! I like what an improbable sartorialist he is - I think it every time I see him. I love this shot. One of the best. It seems to be suspended in another time, like a kind of photografy in certain films as "The million dollar hotel" (with a spectacular Milla Jovovich). That "Marni" looks like a signature in the picture. sweet!! I know the rain = terrible shooting weather, but this shot is great! I love rain! I missed this when you posted, and saw it last night when I was scanning the page. I had to come back to see it again. What can I say? Great. This is why photography is recognized as art. I'd love to see the street shots that you have stashed away because they don't fit the "sartorialist" category. I've got to say you're a great photographer. I love the mood that this picture brings to the watcher. Hey! I know this guy, I saw him here in Brasil three days ago, he is in Itaparica island, and he still has those locks. He was so nice with me. He knows how to speak portuguese! He is so funny, but when I met him it was vacation time and he was at the beach, so how can he not be funny?? It was so hot and he was so casual and simple. I hope my english isn`t too bad, because I`m trying really hard to everybody understands me!